AS A kid, Leigh Edward was the envy of his school friends when his dad Bruce started his own confectionery business. And so the Ferndale Confectionery concept was born — an entire company dedicated to producing “better for you”, sugar-free, natural sweets. In those days, the idea was revolutionary, and Ferndale was the first Australian confectionary company to develop sugar-free products using only natural colours and flavours. Bruce and Vicki Edward in 1996, processing Ferndale Confectionery’s first order. But as awareness about diet and health grew, so did the company. Then 2001 came the game changer — supermarket newcomer Aldi agreed to stock its products. The partnership has more than paid off. Today, Aldi stocks seven Ferndale products, including four ranges of Flirt Chewing Gum and three types of Blitz Mints. 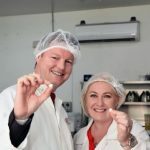 The company also produces JILA® mints and gum, JOLS® fruit pastilles, KOPIKO® coffee drops, LICORETTE® pastilles, SLIM FRUITS® pastilles and JIBBA® jelly beans. The brand has 30 staff members and a second, $6 million processing facility is being built this year and by Christmas, the team is expected to grow to more than 50. More than 25 million packets of sweets are produced each year, and Ferndale has had a minimum 15 per cent year-on-year growth every year with the Aldi account since the partnership began. While Mr Edward did not disclose the company’s turnover, a 2015 Australian Financial Review report described the company as a “$15 million manufacturer”. Mr Edward, 32, is now the general manager of the multi million-dollar business and he said his dad Bruce was a “trailblazer”. “He worked at one of the largest snack food and confectionery companies on the planet but he couldn’t give his family treats, and he found that disgusting,” Mr Edward said. 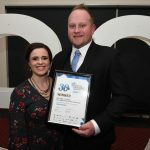 “He spent two years writing a business plan and developing packaging and working out how to bring a better-for-you confectionery to the market. He praised his father’s foresight in contacting Aldi even before the supermarket chain reached Australian shores. “Aldi revolutionised the business, there’s no doubt about it,” Mr Edward said. Mr Edward said he hoped the business would be passed on to the next generation of Edwards in time. Ferndale Confectionery general manager Leigh Edward has worked at the business since his was nine years old. “I was nine when Bruce started the business and I grew up in and around Ferndale, sweeping the floors and putting export stickers on packets during my school holidays,” he said. While Ferndale paved the way for sugar-free treats, the company is not resting on its laurels. Mr Edward said the focus was always on innovation, with the business recently branching out into high-fibre and “tooth-friendly” sweets. He said the confectionery industry was also embracing the growing vegetarian and vegan trend and that Ferndale was focusing more and more on replacing traditional ingredients with more natural options. As published on news.com.au 26th February, 2018.